For storage in North York, Ontario, and surrounding areas such as Downsview and Thornhill, you’ll be hard pressed to find a better choice than Secure Self Storage on Dufferin Street. Here, you can be sure your items are safe: Climate-controlled units protect your belongings from the elements, and 24-hour surveillance cameras and an on-site staff help guard them from theft. Plus, we offer a free truck to help you move in. Whatever you’re storing—just a few household items, company documents, your college belongings or your car or truck—we offer the mini storage, business storage and vehicle storage options to meet virtually any need. 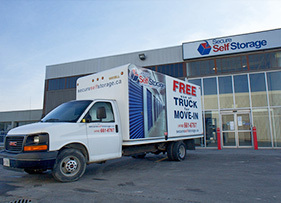 To learn more about our services, and to see how simple and affordable storage in North York can be, come to Self Secure Storage on Dufferin Street. Google Rating: 3.9 out of 5 stars based on ‎29 reviews.